happy reading! And remember- you can always leave me a comment by clicking on 'comment' under the blog post & I'd love to hear what you think! 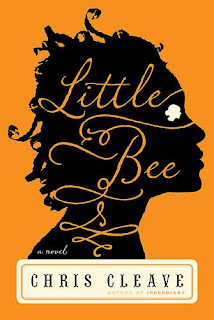 I just finished reading Little Bee by Chris Cleave and feel a small loss for words about what to write. The publishers took a big risk with the promos for this book, they didn't really tell the reader what it was all about - "We don't want to tell you what happens in this book...nevertheless, you need to know enough to buy it" and so they give you a little tidbit about it being "the story of two women whose lives collide one fateful day", but it is so much more than that. First we meet Little Bee and simply fall in love. She is so innocent, but quite insightful. " I wish I was a British pound coin instead of a African girl. Everyone would be pleased to see me coming." Little Bee is a 16 year old Nigerian refugee surviving in a UK immigration detention center. How she came to be in the immigration center is part of the story, as well as how she meets Sarah & Andrew O'Rourke, a young affluent couple from England who were "on Holiday" in Nigeria, very naive to the violence that was raging in the area. Leading up to the tale of violence that links Sarah and Little Bee on that Nigerian beach, we meet a cast of characters from the detention center that will make you laugh and cry at the same time. And it opens your eyes just a bit because you begin to realize that even though this is a fictional book, these detention centers really exist and so do some of the horrors you are reading about. The writing is captivating - and we are drawn into Little Bee's world. We realize how Little Bee is not so different from Sarah. The book is written through both Little Bee and Sarah's voice and towards the end I began forgetting who's voice was speaking to me. The story does not stop at the detention center, and as if their lives were bound by something untouchable on that fateful day, Sarah and Little Bee meet again... I really enjoyed this book! The writing and characters will touch your heart! Make this one of your next reads! 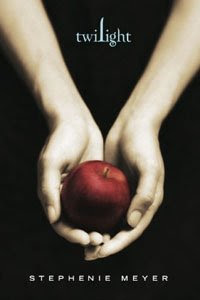 Twilight is well written and enjoyable! Bella seems very real and believable. She is a typical 17 year old! Not really a teenager anymore, but not quite an adult. Dealing with her divorced parents and moving to Forks, Washington to live with her dad is just the start of Bella's story. Pick this book up and be enchanted by Bella & Edward yourself! No, I'm not talking about the grocery store- I'm talking about the Kindle 2! It's the new electronic reading device from Amazon.com. This isn't the first electronic reader- Sony also has one and was the first one I ever saw at my local Borders store. But the Sony e-reader seemed bulky and clumsy to me. (It still does!) Now enter the Kindle 2 - a sleek, wireless, family friendly device that puts the fun back in reading. Maybe fun isn't quite the right word- maybe easier is the proper word... The front of the Kindle 2 is about the size of a trade paperback cover. And it is about as thin as a CD jewel case. On the front sides are the "next page bars" and a "previous page button". Turning the page of your downloaded book is as easy as pressing the bar that your thumb is already resting comfortably against as it is holding the kindle. There are some other neat features too- you can look up words you don't know instantly with another button and if you are reading a newspaper you can "clip" an article to save for later. You can make the text larger if you need to... you can listen to your favorite music while you read... and if you buy 2 kindles and give one to your spouse you can both read the same book at the same time by buying only 1 copy of the book. (both kindles need to be registered under the same name) Amazon.com has over 240,000 Kindle books available for download, usually at quite a discount from the hardcover price. Not to mention there are free e-books also available. And downloading a book is as easy as a click of a button- done wireless virtually anywhere you can bring your kindle. The wireless part of the kindle works on 3G technology, which is 3rd generation cellular technology, so you don't have to be looking for a WiFi connection. And do you think 1500 books is enough to carry around with you? Because that is what the Kindle 2 is capable of holding. But all that aside is plastic nicer that paper? Does the feel of the Kindle in your hands match the beauty of the paper of a real book? Isn't it special to walk into a bookstore and pick up a book you've never seen before and open it up for a peek? The heft of a hardcover in your hand makes it undeniably real. The beauty of the typeface the publisher chooses to use, the type of paper- is it all just window dressing for the actual printed work? I don't think I will ever give up buying books altogether, but I do like my Kindle. And being able to buy new books at a substantial discount isn't so bad either! 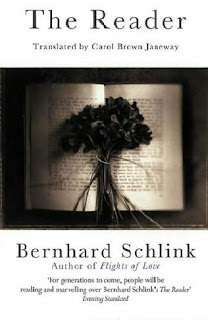 The Reader by Bernhard Schlink is haunting. The writing is direct, but it is as if each sentence is a brush-stroke in a painting and you can't take your eyes off the canvas until the image is revealed. We first meet Michael Berg at 15,who becomes sick and vomits on the sidewalk. An older woman sees what happens, takes him by the arm and brings him into the nearby courtyard where there is a faucet and cleans him up. Then fills two buckets with water and proceeds to instruct him to take one as she takes the other and they clean the sidewalk. Michael is so distraught at what has happened he begins to cry, and the woman takes him into her arms to comfort him and then walks him home. We find out then that Michael has hepatitis and is so sick he becomes bedridden. He tells his mother about the woman that helped him and it was then decided that as soon as he was better he would go and properly thank her. And so he does... That older woman is Hanna and their innocent beginnings turn into a love affair. But this is Germany after the war, after the horrors of the Holocaust and this coming of age story turns into much more... The story is told by Michael in three parts. The first part is the love affair between Michael and Hanna. The second & third parts of the story are the ones that make you wonder how love, shame, redemption and dignity all play a part in each of our lives. Do we have an obligation to save someone even though they don't want to be saved? Can you love someone no matter what? Do we perceive things the way we want to or think we should? I am still thinking about Hanna. It's a book that doesn't leave you right away. It is a relatively short read- 218 pages- and it is well worth the time! It would make an excellent book club read/discussion as well! Read this book! You won't be sorry. The Demise of The Hardcover! In November of 2007 The Guardian, a UK newspaper ran an article about some publishers opting to print new first run edition books direct to paperback. Hardcover first has been a 60 year tradition! But book sales in Hardcover has declined in recent years- people (and book clubs) are opting to wait for the paperback version that usually comes out a year after the hardback. And with the advent of e-readers like the Kindle by Amazon, the traditional form of books is changing. And what book was I reading about? The Housekeeper and The Professor by Yoki Ogawa. Look for that review in upcoming posts!